Last night’s premiere of CNN’s Original Series The Nineties (9-11pm) ranked #1 in cable news among adults 25-54 and younger viewers (18-34) according to Nielsen Fast National data. The episode, The One About TV, attracted 506k among adults 25-54, +82% more than Fox News’ 278k and +315% more than MSNBC’s 122k. 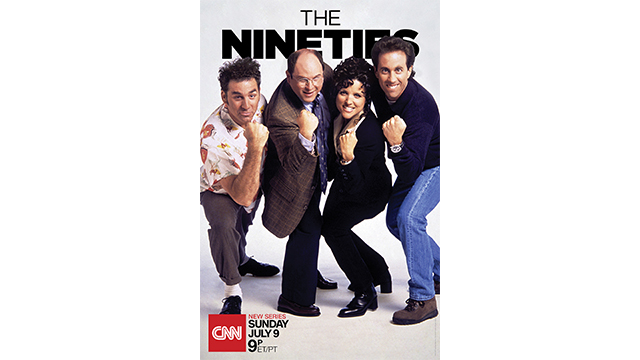 Among all of CNN’s 42 Original Series premieres, The Nineties ranked fifth among adults 25-54. And among all the CNN decade series, last night’s premiere ranked second in the demo, following The Eighties (598k) and easily surpassing The Seventies (291k) and The Sixties (284k). In younger viewers (18-34), the program ranked #1 and outperformed the combined viewership of Fox News and MSNBC with 177k, Fox News followed with 44k and MSNBC trailed with 23k. This is the second best ever performance among 18-34 of all of CNN’s 42 Original Series premieres. In total viewers, CNN topped MSNBC by +196% (1.141 million vs. MSNBC’s 385k); Fox News averaged 1.211 million. The next episode, Clinton: The Comeback Kid, will air on Sunday, July 16 at 9pm ET/PT, followed by an-all new episode of The History of Comedy at 10pm ET/PT. Executive produced by Emmy® Award-winning producers Tom Hanks and Gary Goetzman (Playtone) and Emmy® Award-winning producer Mark Herzog (Herzog & Company), The Nineties is a seven-part CNN Original Series that examines the presidencies of George H. W. Bush and Bill Clinton, technological triumphs and terrorist tragedies, the grunge revolution and hip-hop’s ascendance, interracial conflict across America, and a genre-bending era of television.